I don’t hold actual funerals for my old gadgets, but I do retire them to one of many “Tech Sematary” boxes in my closet since I just can’t get myself to throw/sell/give that stuff away. (It’s also very possible that I might say a few sentimental words of appreciation aloud or silently, before I file that box away, depending on how much I used or loved the device.) Fortunately, I didn’t have to retire my old iPhone 3G as it has found new life as a kind of iPod Touch in my car. So off the top of my head, I know my old Intellivision, Dreamcast, cassette deck, Sony Walkman, Pioneer Laserdisc player, original Gameboy, Commodore 64, NES, Genesis, Power Mac 8500, Dell PC, Motorola StarTAC, Treo 650, and more are all tucked safely away in boxes in the BOTcave. So what’s in your Tech Sematary? i never had an Odyssey2, but my neighbor did, Geoff! when i saw KC Munchkin, i lusted after it intensely, but it was not to be. parents got me an Intellivision soon after, tho! No JB Don’t do it!!!! The Machines they will rise again to take revenge!!!! i understand your concern, Jiro Maeda! especially with jefbot putting his gadgets into a “Tech Sematary”!!! …and they may tell themselves, MY GOD! WHAT HAVE I DONE!? nice, Jiro! i know i have at least one or two VHS players in there, too. wish i had an Apple IIc, tho; those were awesome! uh, i’m afraid to ask what an “Electronic Mistress” is, or what DK uses it for, ESQ! and glad you can relate. now go to sleep! *hands on hips* That goes for you too Young Sultan. wish i’d heeded your advice, Pixie; i’m a total zombie at work today. blegh. Like hell my Dreamcast is in any samantary! I still use it and have the best games ever. Sonic isn’t Sonic unless in a SEGA machine. My old laptop is sitting under the chair I’m in right now (in the living room, mind you, not squirreled away in a basement or something) because I totally planned to turn it into a Linux or Chrome OS laptop for my wife’s nephews to play with. I’ll totally get back to that plan…one of these days. Awwwww! ‘Sniff . . .
Have to mention—I’m using my Netbook this morning, and saw the dialogue before the art. Aaaaand my metamorphosis from person to parent is complete . . . I don’t think the iPhone belongs with the Walkman. Also, I love ‘bot’s expression in the last panel! glad you liked bot’s expression! Haha! Im not hoarding this kind of stuff. but I totaly get the funeral mood that comes with retiring a piece of reliable technology. OYE the collection of technocrap in my house is not even funny! But we don’t consider it junk unless there is absolutely NO way it’s ever going to work again. In fact, The ps2 is hooked up in the bedroom and I still buy games for it. I play it all the time, sometimes for hours on end. i have so many orphaned cords i could start a cord orphanage, KB! glad to hear your PS2 still gets some love – yep, the games for it are still pretty awesome. (especially a bunch of the JRPGs!) fortunately, i got one of those PS3s that’s backwards compatible so i was able to retire my PS2 back to its box, and lovingly stored it away in the back of the closet with my Gamecube and original XBOX. I just recently got rid of several walkmen (of the cassette variety) and a walkman CD player. Still lying around are a few old phones and a broken microwave that has been riding around in the back of my hubby’s pickup. It is waiting to be taken to the recycling place cause I won’t let him take it to the dump. how did you “get rid” of those walkman cassette/cd players, shanna? did you toss ’em in the trash or are they in a box in your house somewhere? (don’t tell me if it’s the former!) and good call on the considerate disposal of the microwave – even if it is riding around in your hubby’s truck, waiting to get dumped! i don’t think i ever had a walkman cd player, dj (but i think Mombot has one somewhere.) i did have one of those mini-cd players, which was pretty cool, but i never really used it much. funny how you still have your old Razor and the new, Android-powered one was just recently released! my tech cemetery usually goes to the gun range for, um, destructive testing. to date there have been 5 VCR’s, about 10 console TV’s, couple of computers, a microwave, a washing machine, a blue toilette, and a pepsi machine. ok, so maybe my tech isn’t very tech. i have a couple of old cel phones in a drawer, but for crying out loud, i still have a cassette adapter plugged into a discman to put tunes in my car…. wish i could take old tech to the gun range, Hairba11! funny, i was just at one on saturday to celebrate a friend’s birthday; they let us put a tennis ball in front of one of the paper targets, but that’s about it, sadly. and i still have a cassette adaptor in my car i plug my iPod into! Just want you to know that there is something wrong with a banner of yours on another site. I clicked on a jefbot banner on weregeek.com just now, and got directed to a site http://www.jefbot.com, which Firefox told me was some sort of attack page. Seeing as your URL is http://www.jeffschuetze.com, you might want to check this out. thanks for the info, Robin! http://www.jefbot.com is just a forwarding address for http://www.jeffschuetze.com, which some browsers see as a threat, but there’s no virus or anything there. i’ll probably change the url on the ad, though, seeing as how i have no idea how many people have been scared off by the notification. Most of my old stuff is computer parts since I both build my own computers and have been poor most of my life. Being poor means I upgrade the hell out of a machine before buying the fundamental parts for a new one and scavenge from other machines that come my way. Most of my friends are poor, too, so the more tech-savvy among them get first choice of whatever parts I have left over. Then I pick through the oldest parts and if there’s stuff no one could conceivably want it goes to expand my computer parts collage on the wall. Anything that’s left gets donated to Free Geek. And of course when I make a trip over I look through their thrift store to see if they have anything I can use to upgrade… and so the cycle goes. i try and upgrade as much as i can before i retire my computers, too, Sharra. so far on my 4 year old (and counting) macbook pro i’ve upgraded the ram, then the hard drive, two OSs and just replaced a faulty fan. hopefully, that’ll keep me in business before the processor and gpu become obsolete for my needs! nice of you to donate parts to your friends and Free Geek. would love to see a pic of your “computer parts collage”! Oh god, I can see it now, the machines merge to become a monster! it’s very possible, John. especially since bot keeps those retired machines in a “Pet Sematary” box! Hey, I had the 8500! It was a great tower. By the time I sold it, I had upgraded the processor (to a G4 I think), added IDE, firewire, USB, gigabit ethernet and some unholy graphics card. i keep seeing ads referring to Zooey Deschanel in that show New Girl as “adorkable” and always think of you, Pixie! *blush* And I find her just as cute as a button and the show is down right ADORKABLE! 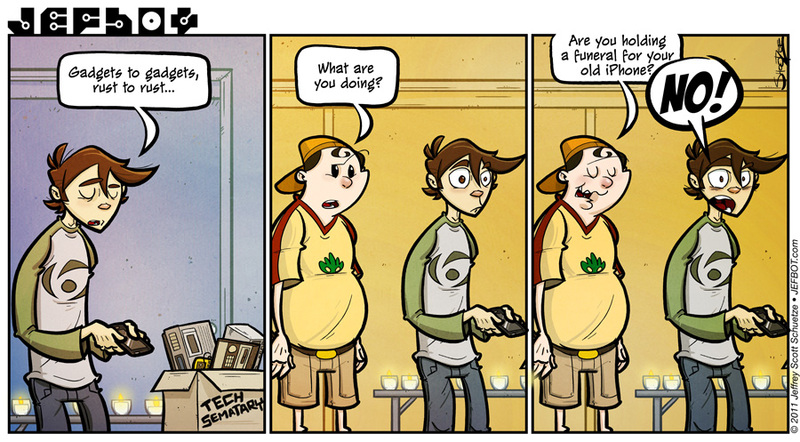 It’s official: You are a tech-geek. And you can use old resistors for beads and make dangly chandelier earrings. sounds cool, Geek! do you have an Etsy shop? LOL… Our entire garage is a Tech Sematary of my dad’s old stuff. Ancient computers you’ve never heard of, lots of old HP instruments, not to mention unused computer cases, boxes of circuit boards, a Teletype, boxes and bags of cables and wire… About the only worthwhile things out there IMO are our two C64’s and VIC-20, still in working order, in bins. i looOOoooved my old C64, Insectoid! it’s in my Tech Sematary, still in working order too, i’d assume. always wanted to upgrade to a C128 or amiga, but it never happened. I think I probably have the oldest pieces of tech in my “closet o’ old stuff”. I still have a working Commodore Pet with an 8″ floppy drive. I used to have a Commodore Business Machine as well, but it got donated to the local ITT University display. The other items hidden away are an IBM 8088 PC and an Atari 800XL. wow! you have quite the collection, Tekara! i remember reading about the Pet, but never had one myself. i used the hell out of my C64 for word processing and games, tho. was such an awesome machine. What do I have in my tech sematary? Nothing, because I’m not, um, whatever the DSM-IV terminology is for people who do that. My Apple II doesn’t count. It still works. You never know when I might suddenly need to play Crossfire. And I’ll finish Ultima IV, one of these days. *drool* my friend had an Apple II and i remember lusting after it, shagbark. and i’m proud to say i finished Ultima IV on my C64, and (as i’m sure you remember) this was in the days before the internet and sites like gamefaqs. my friends at school and i would just compare notes every day and do trial and error stuff for hours/days/weeks. i think that game took me over a year to finish. I did the same thing for my first electric wheelchair, then I repurposed the actuators into a robot..
Hmm, I ecently moved to a different country and I left my tech cemetary behind! Gasp! So all tech I own now actually works, it’s actually quite nice. I’ve never been one for keeping gadgets that don’t work around the house. I used to go through a walkman a year, because I listened to tapes while working, but aside from the old brick Gameboy, I can’t think of things I hang onto. …and the Arc of the Covenant. I thought you learned your lesson! Original GB, GB Color, GB Lite, Game Cube, countless old video games that my computers are too advanced to handle….that’s pretty much it. i still have a soft spot for all my Nintendo-related gadgets, too, KB. pretty sure that loaded with some fresh batteries, they’d all still work! Yeah, but not all the games. I KNOW for a fact my original GB is toast (plus it’s buried somewhere in my room and it would take a ‘Locate Object’ spell to find it. Just for the record, I meant GB Pocket not Lite (I got the see-through Pocket, too awesome). I’m with Hairba11 on this one. I keep tech until it is really and truly dead. Then I test the ballistic resilience of said device. I wish I had been taking video when i put a 12 gauge slug through my old moto droid. Every time I let my comic-reading lag for awhile, I come back to JB and find that…….. The storyline I CAN’T WAIT to keep reading has had NO PROGRESSION WHATSOEVER!!! We last saw Musashi in November of 2009, and Abraxas 8 1/2 months before that! This story is far too epic to be told as sporadically as it is. Abraxas was in the strip just a few comics back, Ed! but, i hear ya re: Musashi, as his story is one that i’m champing at the bit to tell. unfortunately, it’s going to have to wait ’til next year, as it’ll indeed be epic, and i just can’t take it on at the moment. soon, tho, Ed. soooooon! Not really a Tech one. More of a nerd one containing many assortments of legos, video games/consoles. even my sega cdx is still in my livingroom with all its games one shelf down ready to play. I used my original gameboy “the giant grey brick” to play pokeymon yesturday. i swear its indistructible. mabybe its lined with adamantium or something? yeah, those original Gameboys were made to last, drakeye! (adamantium is a definite possibility.) i still have mine with a whole mess of games (loved Final Fantasy Adventure, Gargoyle, and Pokemon (of course! ), and it still runs beautifully. Sadly I’m old enough to remember the Very Old Commodore machines of the late 1970s, and the devotion that was heaped upon them as The New Thing. Many weekends were spent up and down the country at Commodore meets, discussing the hardware, the software, the subroutines…I fondly look upon those meetings these days as PET seminaries. Oh the sematary… Let’s see, have an old Atari 7200, NES, SNES, Sega Genesis, Dreamcast, Ninendo 64, all with a nice selection of games except the Dreamcast…. and all (last I checked) still in working condition, just partially forgotten and tucked away (possibly forever). I looked through mine and I found a Sega Master System, a Mega Drive (Genisis to you americans), an HP Pavillion laptop, a Game Gear, a Snes and a Commodore 64. I’ll make myself more frequent now as I have most of my plans smoothed over, I just need to work on actually saving cash now. Talk to everybody again soon! Gamestop is taking trades on old iPhones, unless your old one truly did die that is. My old iPhone 3G sat in a box for quite some time before I traded it yesterday. It felt good to actually get something out of it. I just wish they were still taking trades on Gameboy Advance models; evidently I hung onto it a little longer than I should have and it has boldly gone to the “Tech Sematary”. I should have paced myself! Hey you mind giving that commodore 64 to me? LOL. I collect old stuff. I was born in the mid nineties so I try to collect all the awesome stuff I missed out on! Working on buying an original Odessey. Those things are gosh darn expensive! Sonic CD and the 2600 Pitfall are my favorites. Sorry for trolling I just like talking about all that stuff! Love your comic! Hope to see many more! P.S. I tried and failed at lucid dreaming! DUDE you can’t just put a Dreamcast in a sematary with an Intellivision!!! That’s sacrilege! We totally need to make one of those!